I cannot remember a time when I could not read, although it must be said that my memories of my early life are hopelessly vague and I remember very little until I was seven years old. At that time I had just moved to Bendigo in central Victoria because my father had been appointed minister at Wesley Methodist Church. Our new home was circled by churches—Methodist, Presbyterian, Anglican, and, towering above them all, the Gothic-style Roman Catholic cathedral. Churches, four; other children, nil. I turned to books for company. 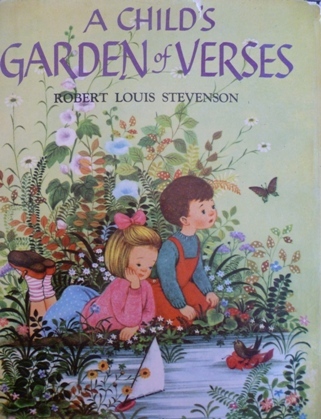 I still have my childhood copy of Robert Louis Stevenson’s A Child’s Garden of Verses. The front cover shows two children in dreamy reverie at the edge of a pond. Inside the covers, new worlds open up. Children climb cherry trees and ‘look abroad on foreign lands’; they clamber into wicker baskets and imagine sailing to ‘Providence, or Babylon, or off to Malabar’; and sometimes they wander dreamlike into ‘the land of Nod’ with ‘none to tell me what to do’. 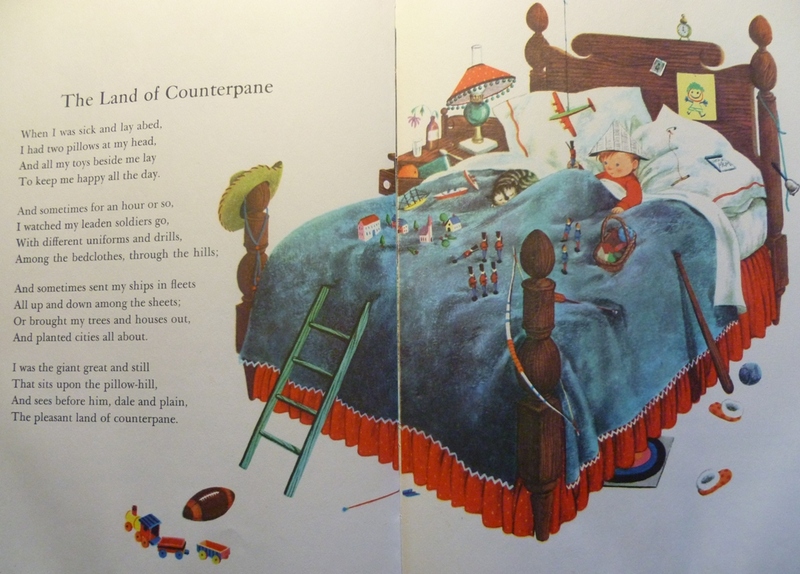 And then there’s the poem that remains my favourite—the ‘Land of Counterpane’, complete with Gyo Fujikawa’s double-page illustration of an enormous rumpled bed. How delicious! Never mind his illness, how wonderful to lie abed surrounded by this chaotic array. Mess. Independence. Imagination. As the daughter of a Methodist minister, I lived in a caring but careful environment. In those days, Methodists—rightly renowned for their stirring singing and social justice advocacy—had a reputation for wowserism. No alcohol was permitted on church property, no sporting activities were allowed on a Sunday. (So much for my career as an Olympic swimmer—the Bendigo Swim Club met on Sunday afternoons.) This moral straightjacket stymied me at school. If I stepped out of line, I was accosted by teachers with the charge that ‘we wouldn’t have expected that sort of behaviour from you’; if I lived up to expectations, my class mates taunted me with ‘you’re such a goody two-shoes’. But in stories and poems, like those in Stevenson’s Child’s Garden, I could do as I liked and be who I liked. The boy didn’t mind if I joined the chaos on his rumpled counterpane, the children didn’t seem to notice when I squeezed into their already crowded wicker basket or took up room on the branch of the cherry tree. They just went right on doing what they were doing. And all the while, those vigilant people around me nodded approvingly, thinking to themselves ‘she’s just reading’. I guess those childhood experiences set up the patterns of a lifetime. When I read now, no-one knows where I am or who I am with or what I am doing. I might be tramping the ancient roads of Britain with Marcus Flavius Aquila, I could be gallivanting around the world with Allan Karlsson, or I might be slumped alongside Henry Skrimshander in a college locker room. People watching me might think I’m alone in a cafe, or relaxing on the couch, or snug in bed at the end of a long day. It’s not true. 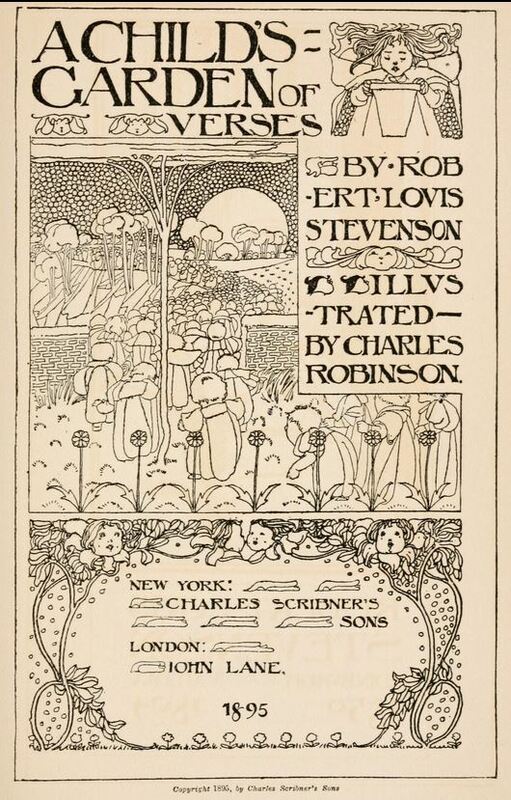 Originally published in 1885, Robert Louis Stevenson’s A Child’s Garden of Verses has been regularly reprinted and is still available in various illustrated editions. Fujikawa’s illustrations (first published in 1957) are available in Sterling Publishing’s 2007 edition. You can view a digital copy of the 1895 edition via the Internet Archive. The RLS website provides some background to Stevenson’s collection. Spufford, Francis. The Child That Books Built. London: Faber and Faber, 2002. Brennan, Bernadette. ‘“Alone and in Close Company”: Reading and Companionship in Brenda Walker’s Reading by Moonlight.’ Australian Literary Studies. 27.1 (2012): 62-75. Walker, Brenda. Reading by Moonlight. Camberwell, Vic. : Hamish Hamilton, 2010. And if you’re wondering about some of those people I have been spending time with, here is where you’ll find them: Marcus Flavius Aquila is a young Roman officer in Rosemary Sutcliff’s Eagle of the Ninth (1954), Allan Karlsson pops up in the most unlikely places in Jonas Jonasson’s The Hundred-Year-Old Man Who Climbed Out the Window and Disappeared (2009), and Henry Skrimshander is navigating US college life in Chad Harbach’s The Art of Fielding (2011).